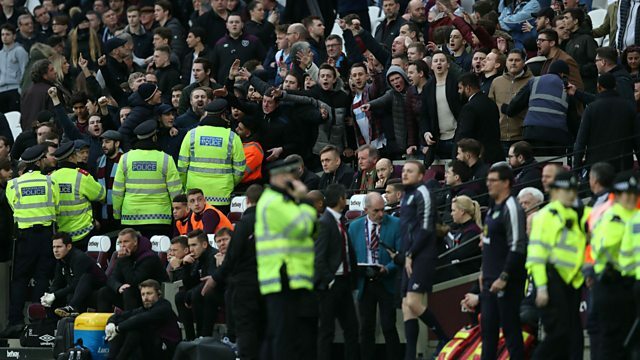 BBC commentator John Motson provides an eye-witness account to the scenes which marred Saturday’s game between West Ham and Burnley. BBC commentator John Motson gives an eye-witness account of the scenes which marred Saturday’s game between West Ham and Burnley. Motson was sitting in the directors’ box, which was the focus for the anger of hundreds of Hammers fans. Tottenham boss Maurcio Pochettino brings us the latest on Harry Kane after an injury to the striker marred their 4-1 win at Bournemouth. Plus you’ll hear from Petr Cech after he saved his first penalty since 2011 during Arsenal’s 3-0 win at home to Watford. Find out what the pundits think about the biggest stories in sport.